Mercedes-Benz Canada and its national dealer network are pleased to announce the company's best-ever March results, with 4,790 units retailed for a 6.3% increase over March 2016. This strong outcome contributed to another record-breaking first quarter, which saw 12,506 units sold, up from 10,830 units in 2016, for a 15.5% increase year-to-date. In March 2017, the company surpassed 4,000 unit sales for the first time ever. A total of 4,192 luxury light trucks and passenger cars were delivered, representing an increase of 12.3% over March 2016; year-to-date, the number of vehicles sold rose to 10,760 units (+16.9%). The passenger car segment saw strong sales throughout the month, with 2,288 vehicles delivered for an increase of 9.2% over the same period last year. These were bolstered by the continued popularity of the C-Class Sedan and Coupe models, which saw a month-over-month and a year-over-year increase in sales of 11.8% and 41.2%, respectively. Sales of the E-Class and S-Class also generated noteworthy increases. In March, sales of luxury light trucks increased by 16.3%, or 1,904 units delivered, which fuelled a year-to-date growth of 12.9%, or 5,050 units sold. 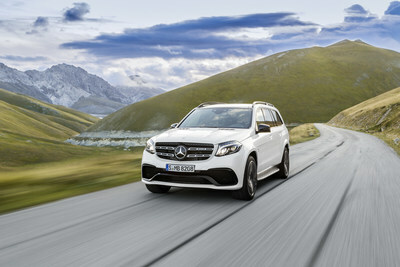 This growth was strongly supported by sales of the GLC SUV, which saw a 90.8% increase in sales month-over-month and 75.5% year-over-year. The continued popularity of the GLC and GLE Coupes and of the GLS also contributed to the segment's upward trajectory. March was the best-ever sales month for Mercedes-AMG vehicles, with 1,011 units retailed representing a growth of 46.7% over March 2016. Year-to-date, this brings the total number of Mercedes-AMG units delivered to a record-breaking 2,496 (+87.4%). Mercedes-Benz Vans also posted record-breaking gains in March. The Division not only achieved its best-ever March results, with 555 units sold (+8.6%), but also set a new first quarter record with 1,653 units retailed, an increase of 44.6% over the same period in 2016. The Sprinter continues to be a compelling draw for Canadian consumers, with a 35.2% increase in sales month-over-month contributing to a 67.9% year-to-date growth in sales. 43 smart fortwo vehicles were delivered in March. The Mercedes-Benz Pre-Owned division reported sales of 1,712 units in March 2017, which represented a 4.6% growth over 2016. Year-to-date, 3,767 pre-owned units were sold, up 5.0% from 3,588 in 2016. Sales of Certified Pre-Owned vehicles also increased in March, with 1,379 units retailed for a growth of 5.2% over 2016. Year-to-date, 3,030 Certified Pre-Owned units were retailed, an increase of 8.0% that helped to push overall penetration from 78.2% in 2016 to 80.4% in 2017. "While Mercedes-Benz Canada has been doing very well for many years, I don't think I have ever seen so many records broken at once! To have surpassed sales of 4,000 new cars in one month for the first time is an exciting milestone for Mercedes-Benz Canada and our entire dealer network," said Brian D. Fulton, President and CEO, Mercedes-Benz Canada. "Everyone's hard work and dedication have allowed us to complete the first quarter with a strong finish. It is gratifying that our products, our offers and our commitment to the Best Customer Experience are resonating with our loyal and long standing customers, while also attracting new customers to the brand." Mercedes-Benz Canada is responsible for the sales, marketing and service of the Mercedes-Benz and Mercedes-AMG passenger vehicles, Mercedes-Benz Vans and smart. Headquartered in Toronto, Ontario, Mercedes-Benz Canada Inc. employs approximately 1,500 people in 21 locations across Canada. Through a nationwide network of 11 Mercedes-Benz owned retail operations and 47 authorized dealerships, Mercedes-Benz Canada sold 48,320 vehicles in 2016. This represents the best year ever for the company and has positioned Mercedes-Benz as the top luxury manufacturer in Canada for the third consecutive year.